After completing their compulsories and free tests on the first few days of competition, the top vaulters returned on Thursday for the technical test. 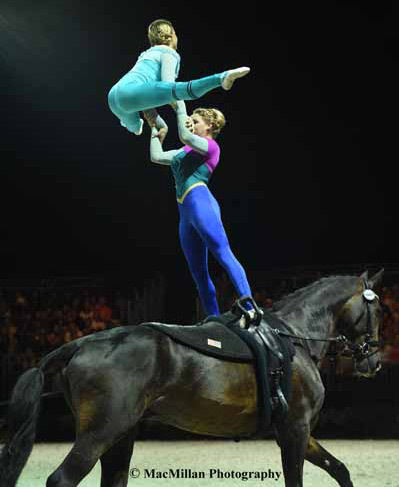 This test allows vaulters to express their artistry through costume and music selection as well as choreography. What distinguishes the technical from the other tests is the requirement to complete five pre-determined movements. These movements are designed to showcase jump force, timing coordination, suppleness, balance and strength. Elizabeth Ioannou was the first American woman to perform her technical test. Her routine was inspired by the Disney depiction of Snow White. Although her horse appeared to be a bit forward-going, she managed to perform each movement well. Mary McCormick was next for the Americans with Palatine. She performed a very impressive tests, showcasing her strength and flexibility. Her 7.989 helped to move her up in the standings. She finished in third position at the end of the session. Reigning WEG gold medalist Joanne Eccles of Great Britain performed flawlessly aboard WH Bentley. Bentley is longed by Eccles’ father, John. 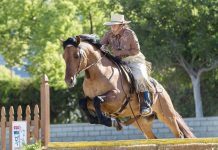 She appeared in perfect harmony with her horse’s motion as she executed each exercise with strength an balance. Her performance earned an 8.513 to retain her lead in this year’s championship. For the men, Gabe Aniello was the first American to perform in the technical test. He had no major errors in his test on Ferdinand 194. He looked very happy with his performance, which scored a 6.691. Kristian Roberts of the U.S. was next. His dramatic performance aboard Diva 506 showed immense strength and control. Roberts earned a 6.971 from the judges. Germany’s Erik Oese was the first of the overnight top five to vault in the technical round. He performed nearly perfectly, scoring an 8.400 to move from third to first on the leaderboard. France’s Nicolas Andreani finished in second place with a solid routine that included quintessentially French elements of mime. Teammate Jacques Ferrari finished a close third. In the Pas de Deux, the Austrian pair of Jasmin Lidner and Lukas Wacha were among the first vaulters on the schedule. Their routine aboard Bram earned them a 9.083 and an early lead that they held through to the end. Gera Marie Grun and Justin van Gerven of Germany earned an 8.631 to slip into second place. The longeur for this team is a familiar face in the vaulting world. Patric Looser, 2010 men’s individual gold medalist, longes Danny Boy 25 for the German team. The Eccles sisters of Great Britain, Hannah and Joanne, performed their powerful “fire and ice” routine on W H Bentley. A few minor wobbles at the beginning cost them, but their 8.570 put them in third place overall at the end of the round. Two American pairs finished in the top ten. Cassidy and Kimberly Palmer finished in 6th place with Leon 364. Mary Garrett and Kristian Roberts finished in seventh place with Diva 506. Vaulting concludes on Friday with the individual, team and pas de deux finals.